Change the Fabric Style for a Runner to Enjoy All Through Fall! 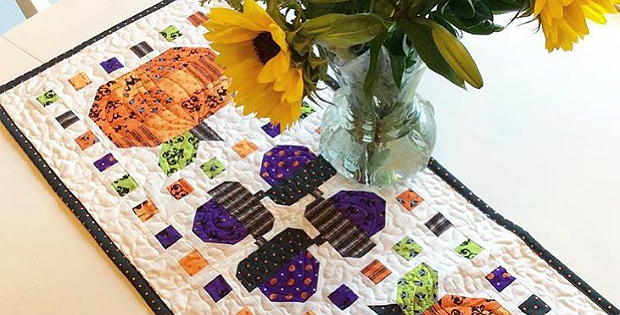 Acorns and pumpkins come together in a delightful runner to enjoy all during autumn. Choose colors and fabrics for Halloween, or select more generic autumn prints and display the runner through Thanksgiving. Orange pumpkins and green leaves are accented nicely by the purple acorns. Other acorn colors will be lovely, too, so go with what most appeals to you. Standard piecing is used to create all the blocks. That makes the runner simpler to complete than it may seem at first glance. The finished runner, from This & That, is 15″ x 35″. 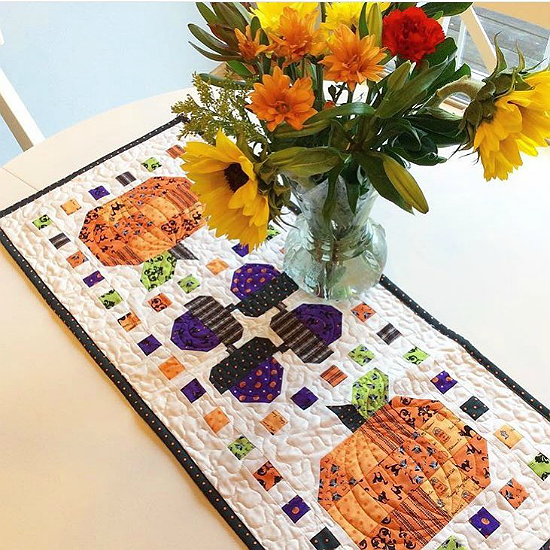 Click here to purchase the “Spooky Delight” table runner pattern.